A friend who works as a merchandiser for a book store and is a voracious reader herself highly recommended, “A Wild Ride Through the Night” by Walter Moers. And things could not get better, since I picked it up at a sale for only 99 rupees and that too a hardcover!! I could not be more happy than this! The beauty of the book is that Moers has constructed the entire 187 page novel from illustrations. And whose illustrations would those be? They are the classic woodcuts of the late Gustave Dore (who also happens to be the book’s protagonist). Moers’ happy, eccentric tale fits the illustrations like a glove. I wonder what prompted him to write such an imaginative tale. The twelve-year old Gustave survives a Siamese Twin Tornado, only to find himself facing Death and his sister Dementia, who decide to play dice for first dibs on Gustave. Gustave in desperation secures a deal with Death – if he can fulfill a series of seemingly impossible tasks, he can go ahead and live his life for a long time. And from there begins his wild ride through the night – since the tasks need to be finished in one night. He encounters damsels who attack dragons, an alligator who lures his prey and then devours them, a crazy woman, six beasts and a ride on the moon and back. Walter Moers’ brand of fantasy is not only comical but also unique. His wacky creatures and endless possibilities are a marvel. It also happens to be a simple book and very easy to understand. I love the way it is based on woodcuts. A must read!! This entry was posted in Books and tagged Fairy Tale, Fantasy, Gustave Dore, Illustrations, Walter Moers on June 12, 2009 by thehungryreader. 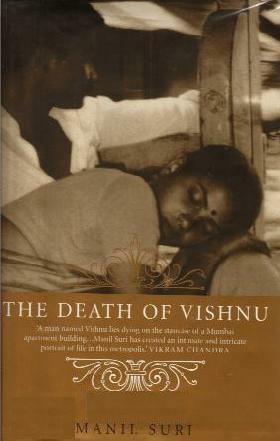 On a breezy Sunday afternoon, I happened to read “The Death Of Vishnu” by Manil Suri. I picked up this book with great trepidation. Also, on the personal front, who would like to read about a man dying? That’s what I thought until I read this one. As the title goes, the narrative also comes directly to the point – that of Vishnu, an odd job man, laying dead on an apartment landing of Mumbai. This is where the crux of the story lies. Here we meet the Pathaks and the Asranis, two arch rival neighbours; what’s worse is that they share the same kitchen and each claims to be taking care of Vishnu better. Then on the other hand there are the Jalals – the husband who doesn’t believe in any religion and just wants to gain spiritualism the easy way; the son Salim who is madly in love with the Asranis’ daughter Kavita (here comes the Hindu-Muslim divide). And what’s surprising is that all these characters are intertwined with one. And the connecting factor: Vishnu! The story binds itself based on what others perceive Vishnu to be – his mother, the Pathaks, the Jalals, the Asranis, Padmini, Kavita, and others like the scavenger and the sweeper working in the apartment. There is a holistic perspective to the point that it infringes on who Vishnu really is and what he embodies for all the bystanders. There is a singular thread running through the book – that of isolation on various levels. The Pathaks and Asranis share a kitchen, almost to the point of invading each other’s privacy and yet are so distant and cold. Vishnu is dead and yet no one wants to claim him and take him to the nearest morgue. Her husband and son, seeking refuge in intellectualism and staunch belief, leave Mrs Jalal alone. Vishnu in another realm altogether believes that he is God (or rather is made to believe that by Mr Jalal) – Vishnu, who had ten reincarnations. His love for… Padmini, his longing for Kavita, and his thoughts on living make the book one delicious course. This book is not an easy read. There are layers and sub-layers to this course though. On the surface, things are quite simple and easy to understand, but what Mr Suri has created is something else. He has created what one might call “a quilt of emotions” – right from love to the isolation one feels in the metropolis to the bare human nature. In short, Manil Suri has created a Universe in an apartment of Bombay – a city so huge and yet so cold and distant. So uninviting. The spiritualism as one would expect from this book is on many levels rather ambiguous and unclear. In the sense that while the author tries to portray the elements of reincarnation and giving up on worldly pleasures – like Mr Jalal often tries doing – it all is actually a mockery of the same. One of the redeeming features of the book is that it is not written from an outsider’s perspective. It is carved by an Indian living in India and breathing the air, which was what Vishnu did. An ordinary man elevated to something extraordinary to satisfy the superstitions and religious notions of the upper notches of society. This is where the element of comedy throws itself in your face. The prose is certainly clever; however, the ending is left hanging. Possibly the author expects the reader to decide that for himself. In many ways, this resembles a grand chorus from a huge and wonderful comic opera, with all the inhabitants of the building singing at once. And underneath all the voices wailing about their personal concerns is the insistent bass of Vishnu as he prepares to die. Dealing with the most basic aspects of religion, love, and human kindness in a city setting which challenges its inhabitants to the limit, Suri creates a warm, funny, and very human drama of a every man’s search for meaning in life. Suri writes with obvious affection about a Bombay perhaps already lost, evoking easily its moods and attitudes, its light and smells. One can almost feel the heavy evening sea breeze, taste the roasted peanuts sold in paper cones along the sea wall, or see the Maharaja looking down from the Air India hoarding. A Bombay that rings true with its Irani Cafe, cigarettewalla, and radiowalla. Manil Suri’s sharp eye for detail and natural ability to create a strong sense of place and time define his considerable talent, and one can look forward with a certain assuredness to its maturing in his promised books on the other two Gods of the Hindu trinity, Brahma and Shiva. This entry was posted in Books and tagged Bombay, City Life, Indian Authors, Indian Writing in English, Loneliness, Love, Manil Suri on June 12, 2009 by thehungryreader. Oh yes and how have I waited to read this graphic novel or should I say comic book to be more politically correct! And finally I did manage to finish reading this 138-page book about a hotel at the end of the world and the story of the travelers who visit it. The book plainly is about Kona and Kuja who on their journey to China stumble upon the trail of the Floating Island, which promises plenty of everything. It is about the story of Pema who lost her love, while her husband speaks of Japanese soldiers’ ghosts and of World War II. The story is of the little girl who lives with Pema and her husband and how she chanced upon something unexpected. The story is of the philosopher who is blind and yet I feel sees the most. What I loved about the book was its simplicity and yet the complexity that ran on various levels. The thread of loneliness that binds each character with the other and the hesitancy to say it aloud and be understood at the same time. I have always loved reading a Graphic Novel and this one did manage to grip me and make me think. The illustrations are beautifully done and are without any pretensions. Yes the tale is biased to the north-eastern region of India, however at some level it could be anyone’s tale. A strange story at the same time and yet fulfilling. A must read!! This entry was posted in Books and tagged Books, Comic Book, Fantasy, Graphic Novels, Indian Author, Indian Writing on June 12, 2009 by thehungryreader.